A huge collection of fun Jeep-related stuff! Here, Jeep owners are sharing their own tips for doing the Jeep wave, the best online Jeep forums, how to find Jeep clubs, and lots of other fun Jeep stuff that only Jeep owners would understand. A great ‘Stomp’ style video from Julian Smith and his Jeep Cherokee. Some of the best videos featuring Jeeps offroad. Be Different… Send Jeep Holiday Cards This Year! 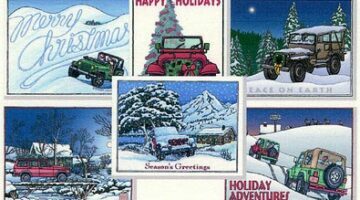 These Jeep holiday cards feature Jeeps in 6 different settings and you get a couple cards of each design in this boxed set. Fun, fun, fun… Your Christmas cards will be different from everyone else’s! Last year, Jeep had a fun contest where they hid Jeep Travel Bugs all across the U.S. and with the aid of a GPS, you could participate in their geocaching game to win fun prizes. 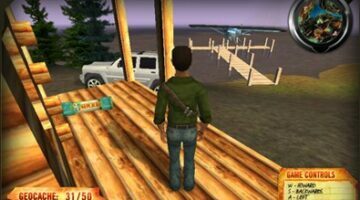 This year, there’s no such game — yet — but they do have an online version of Jeep geocaching that they’re letting people download and play for free. Check it out! 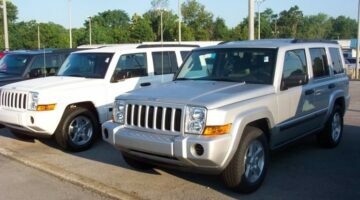 Jeep vs Hummer: Is There A Rivalry Or Not? I have to think that there’s an unspoken rivalry between Jeeps and Hummers and the people who own them. It’s all in good fun, of course. Or not… So, does anyone REALLY care that the Hummer might be on its way out? 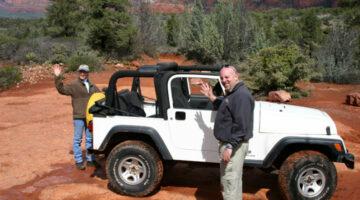 I’m a Jeep tour guide in Sedona, and many people think that this would be a dream job. If you are one of those, read this first! Here’s everything you want to know about Jeep tour guides, including how to get hired and what to expect your first days on the job. 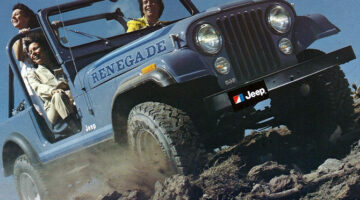 Jeep’s newest marketing strategy incorporates the tagline ‘Have fun out there.’ What a concept! 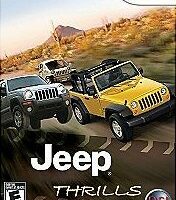 We’ve all known for years that Jeeps are fun vehicles to ride in and drive. Now… they’re promoting just HOW much fun you can have in a Jeep. Tenor is part black lab, part great pyrenees and part Jeep dog. 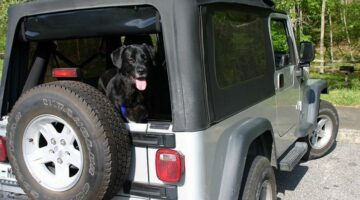 This is the story of how one dog earned his Jeep legs, and became accustomed to long car rides in preparation for being the world’s best RV road dawg. Bye, Bye Golf Carts… Hello, Luxury Electric Vehicles! Fun Vanity Tags: European License Plates! Thinking of putting a vanity tag on your vehicle? We’re considering putting a European license plate on the front of our Jeep Wrangler Unlimited. So I did some research on license plate companies and here’s what I found. We love Jeeps. And we enjoy good ads. Combine the two, and what have you got? The best Jeep commercials… ever!